This post is not a “magic bullet”. It’s main purpose is to save those of you who have this same problem lots of wasted time and effort. I wish somebody had told me this sooner. :-) For months I have been trying every product and method known to man or woman to remove the mold that had somehow taken hold in the two corners where the shower door meets the shower stall. I started out with natural cleaners (lemon juice, vinegar, tea tree oil, etc) and eventually was forced to try more caustic measures. My most recent attempt involved spraying straight bleach from a spray bottle, letting soak for several hours and then trying to rub off the black stains with a Magic Eraser. Nothing. After more research today on the subject, I finally realized that NO CLEANER was going to get rid of this gunk because it was now PART of the silicone caulking. It wasn’t something that could be scrubbed off, because it was IN the caulk. ugh. While that was NOT what I wanted to hear…it made perfect sense and I had reached the point whereI was willing to do WHATEVER it took to get rid of it. 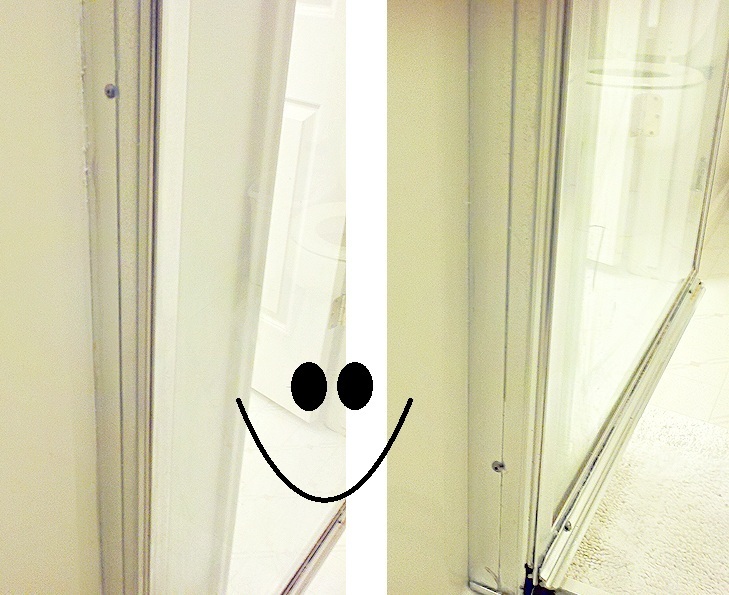 So…with a single-edged razor blade and a pair of tweezers…I proceeded to remove the caulk on the two shower door seams. It was actually a lot easier than I thought it would be. Run the blade underneath the edge of both sides of the caulk line, then I took the tweezers and pulled off sections at a time. Probably took me about 15 or 20 minutes. Tops. And here is proof positive of what I was talking about. See that black spot. That is mildew ENCASED in the silicone. 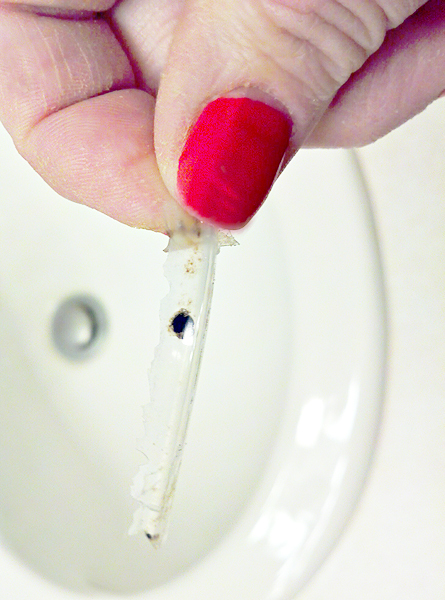 It’s not on the surface of either side of that little clear piece of silicone…it is actually embedded inside of it! No WONDER nothing I tried worked! After I’d scraped off all the silicone caulk…I gave the areas another good cleaning with some diluted bleach and dried it thoroughly. (It should be noted that now that the caulk has been removed…other less caustic cleaning agents could be used such as Lemon Juice, Vinegar, Hydrogen Peroxide, Tea Tree Oil or Borax). I can’t tell you how thrilled I am to FINALLY have that black stuff gone! 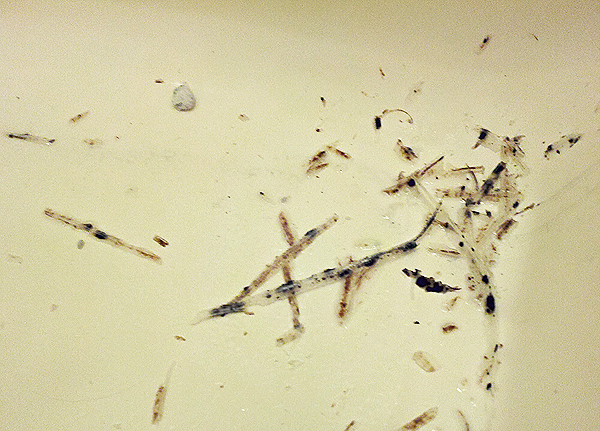 Even though it was a very small amount…mold is nothing to mess around with. 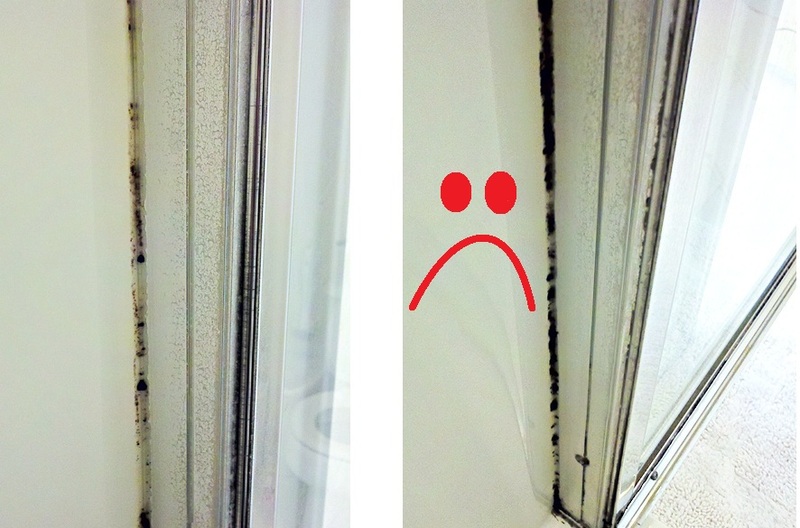 Shower mold dangers include a number of respiratory disorders, stomach infections and allergies. Now that the mold is gone…it’s all about prevention. Obviously ventilation is important. I plan on replacing our bathroom ceiling fan with a new and improved model. It doesn’t seem to be doing the job lately and has been making a crazy sound. I’m also going to take the advice of my friend Denise in ARK and keep a “shower drying towel” hanging on a special hook in the bathroom and do a quick wipe down after each shower. But for now….I’m off to research how to replace silicone caulking in your shower! Add 4 ounces of tri-sodium phosphate which is commonly known. You will need to mix a cup of it in a gallon of water and then scrub the affected area two or three times until all the traces of mold have been removed. but if done improperly you can make the damage worse. scope of function. Also get readings from places where chimneys, porches, garages, and patios attach to the house. This is a very interesting question that everyone would like to know. How did you replace the moldy silicone? Mine is awful, and want to do what you did, but then how did you fix the gap that silicone left?